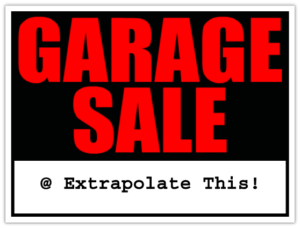 Garage Sale This Weekend! | Extrapolate This! This is the weekend! After careful analysis of the garage sale market, updates from the Chicago weather teams, a scientific study from MIT…well, not really. More like Joe has finally stopped dragging his feet so the garage sale is finally happening! Thankfully, the forecast is looking good. We’re only doing the sale on Friday and Saturday as I wasn’t sure we would have enough product for Sunday. But who knows, once we’re set up, we’ll see what happens and maybe run Sunday as well. We’ve been pricing all the items we have up for sale this past week and trying to get things set up in the garage so we can just pull them out on Friday morning. We really only had a couple of tables ourselves and wqickly realized we needed more. Thankfully a friend had a few she let us borrow. This will make our presentation look all that much better. And forget visiting the local Target/Walmart/Home Center for garage sale supplies. Instead hit the dollar store. Cheap and pretty nice. You don’t want to spend $30 on supplies and start the day having to make all that up first. I’ll put together a recap for next week after it’s all done and we’ve sold everything! A guy can hope we sell almost everything.